I think very few of us have heard of BluRay discs that contain only high-resolution audio tracks without video, adopting the protocol "Pure Audio"... and fewer still have them in their own record collection. Yet, in my opinion, this is a real missed opportunity for our audio world. The Pure Audio protocol (which is not a new format, but only a way to manage audio streams within a BluRay disc, which is then read by any BD player) was presented in 2009 and standardized by AES in the following year. 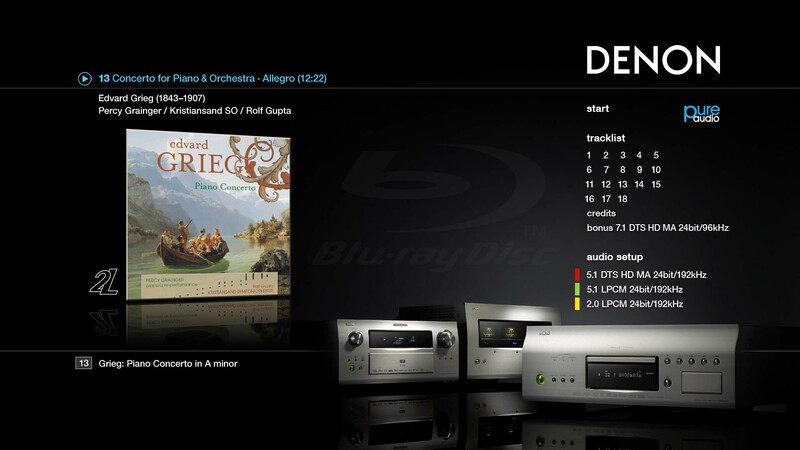 To summarize, the benefit of the protocol "Pure Audio" is to control the reading of a BluRay disc as if it were a normal CD, simply by inserting the disc into the player; playback starts automatically, without having to select the appropriate item from the main menu and without ever needing to turn on the TV. Sir Georg Solti, to celebrate what would have been his 100th birthday (Solti was born in 1912 and died in 1997). The original master tapes were acquired digitally in stereo PCM at 192 kHz / 24 bit. In this case, the laboratories' msm-studios ", which carried out the BluRay authoring, assigned the four colored buttons on the remote control to navigate through the four operas that comprise the Ring (instead to use them to select the different audio streams) without the necessity to switch-on the TV screen. However the BluRay is just one of the media contained in this edition, really rich, which includes 14 CDs with The Ring of the Nibelung, 2 CDs with an introduction to the Ring by a pupil of Wagner (Deryck Cooke), 1 DVD with a BBC/ORF documentary ("The Golden Ring") in English and German, 1 CD with the Overtures by Wagner recorded in Vienna during the years of the Ring, and finally the BluRay which has been mentioned, as well as libretti, scores, more descriptive material etc. The cost of the entire box should be about 250 Euro. And for those who want to further investigate the issue, I conclude with a description of the characteristics of Pure Audio with some comments on its purpose and its potential. First, the "Pure Audio Blu-ray" is a method, not a new format, designed to produce an audio-only Blu-Ray disc and allow its use in the easiest way possible, while maintaining compatibility with all existing and future Blu-ray players. standard began August 10, 2009. The final approval of the project and its transformation into an AES standard, with the number X-188, took place May 22, 2010. The specific name of the standard is: “AES-X188, Screen-less navigation for high-resolution audio on Blu-ray Discs”. - Despite having a PC, they do not know how to use it at best and therefore can not easily manage the high-definition music files (how to download, how to storage, which programs to use for reading, how to make secure backup of downloaded data, how to install interfaces and their drivers, how to connect physically the PC to the interface and then the interface to the stereo system, and so on). 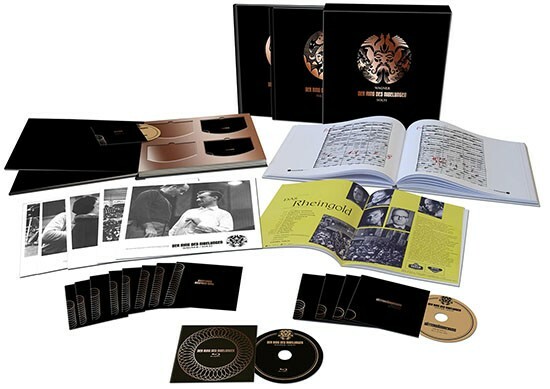 - Finally: while being comfortable with all of the above, they continue to feel a sense of nostalgia for the "physical media" (cover, booklet, disc): that is, something that has always built step by step their music collection. In short, the system capability is really great and its potential too. We really hope that the race of the Pure Audio continues. First of all I want to thank Angelo for allowing me to write on the Audio Activity website. I begin my collaboration with an article on how to analyze a music track from a CD by using a specific software (in this case, Adobe Audition, but it is also possible to use a free software like “Audacity” or similar ones, even if the results are generally less precise). If this kind of technical articles will be considered interesting I will be glad to propose other of them, on similar topics, obviously collecting suggestions from readers. What is the target of such analysis? The main purpose is to clarify some doubts on the recording and satisfy some “technical curiosities” on the peculiarities of the tracks themselves, especially when doing a comparison between different versions of a song (eg. the original version of a disc and its new remastered version). In fact sometimes the results of the analysis are not directly related to the results of the listening, and, conversely, most of the times, this kind of analysis gives very little information on the sound of the track itself. In fact, often he who analyzes (before listening) two similar tracks, or different versions of the same track, suggests himself considerations and conclusions which are then heavily modified or even distorted when the two tracks are heard in comparison. 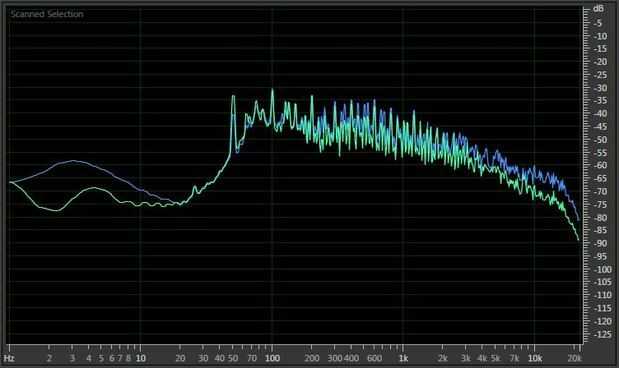 This is one of those cases where the ear is the undisputed judge: we know that the "listening pleasure" comes from a long series of factors, especially psychoacoustic, which are practically impossible to analyze analytically by instrumentation. This said, let's start with the analysis of two different versions of the same track. I chose one that practically everyone knows: "Birdland" by Weather Report, included in their album "Heavy Weather". The original LP was released in 1977 while the CD was released in 1984. 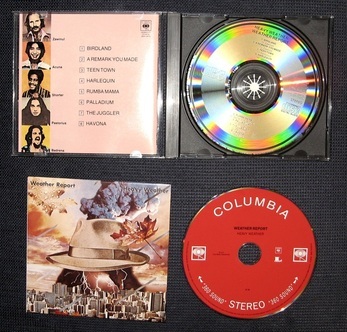 The disc I purchased at the time (from which I extracted the first track in analysis) was printed by CBS / Sony in Japan and has the catalog number CK34418. Then I recently bought on Amazon the box "The Perfect Jazz Collection -Vol.1" which contains a remastered version of 2010 of Heavy Weather -catalog number LC80162. From the latter I extracted the second track to analyze. In the following figure the first disc (the original, in plastic case) is at the top, the second (the remastered one, with paper envelope) is at the bottom. Listening to the remastered version I noticed that they did a good job. The overall timbre of the original CD was good, the dynamic was adequate (a little compressed, but not excessively) and the instruments were well located all along the stereo scene. A typical jazz / rock recording of the late '70s, with more positive than negative aspects, if we evaluate them with the critical skills and "audiophile" criteria that we all have developed over the years listening to one format and the another (vinyl, cassette, CD, HD audio, etc ...). In the remastered version the tonal balance was a little revised: bass frequencies are much more present, both globally and in individual instruments (eg Pastorius's bass is more in evidence during his passages); mid and mid-high frequencies are a little softer than the original, but generally more "clear", probably thanks to an A / D converter more sophisticated than the one used almost thirty years ago. Of course, this consideration is valid only if the remastering was done using the original analog master or a copy of good quality, and not a digital acquisition of the analog master made earlier, but this we can not know. In most of the tracks the engineers adjusted at certain points certain passages particularly important to “highlight” them. Just to give an example: in the central part of Birdland, around 3'40 ", Shorter's sax is a bit more in evidence than in the original version. Finally, the overall dynamics is dramatically improved, which is quite unusual for a remastered copy, and considering the "havoc" we have witnessed in the last decade. 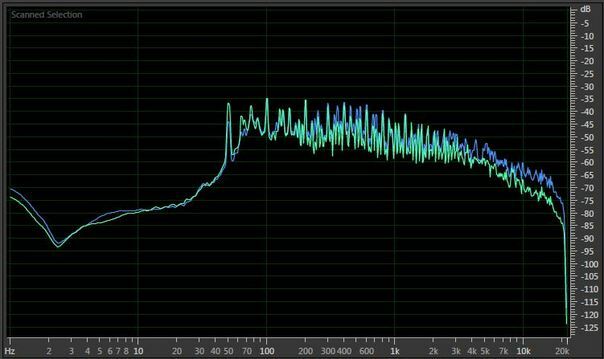 Fortunately this was not done by simply raising the average level of volume (unfortunate trend of the so-called "loudness war "when taken to the extreme). While in the original recording the crescendos tend to flatten out during their increase, until you have a few decibels of dynamic between their beginning and their end, in the new version the increase occurs more gradually, better respecting the original dynamics of the tape (and this is easily verifiable via instrumental analysis, as we shall see shortly). In short, a good job that does not upset the original version but made it, in my opinion, even more enjoyable. And now we come to the instrumental analysis, carried out as mentioned with Adobe Audition and using only the analysis functions of this complete program (which means to use 5-10% of its capacity, since it allows an impressive array of features for treatment and processing of music that wouldn't be pertinent here). Let's see the waveform of the two versions of Birdland: In fig.1 the CD version of 1984, in fig.2 the 2010 remastering. (Note: in this analysis we consider only the track Birdland, but the considerations can be extended to the entire disc as the remastering is very homogeneous). It may be noted that in the original version there are no clipped peaks, but the performance was a bit "sacrificed" by compression during the loud musical passages. Nothing unusual or negative: in 1984 was usual to proceed in this way. In figures 3 and 4, I highlighted in red the areas of the right channel, in the first 2'40 "of the track, where the difference between the two versions is most visible. In the first area shown there is almost no difference (apart from a "small detail" that we will see shortly), while in the second and third areas we can see that dynamic was a bit '"recovered" compared to the first version and now the highest peaks of the two passages often touch the 0 dB. I said that in the first area you can see a special feature. In fact, when observing well the two versions and moving your eyes from one to another, you can notice that between the two tracks the phase is reversed: in figure 6 I highlighted the upper front of the waveform of the left channel in the original version, which contains several peaks, which are "mirrored" in the waveform of the remastered version. In conclusion here is an "overview" of the frequency response of both tracks. Also the high range (around 20 kHz) is different: the original version is affected by the application of a very steep anti-aliasing filter, as were those used in A/D converters of the time, while the remastered version has a more "natural" roll-off. 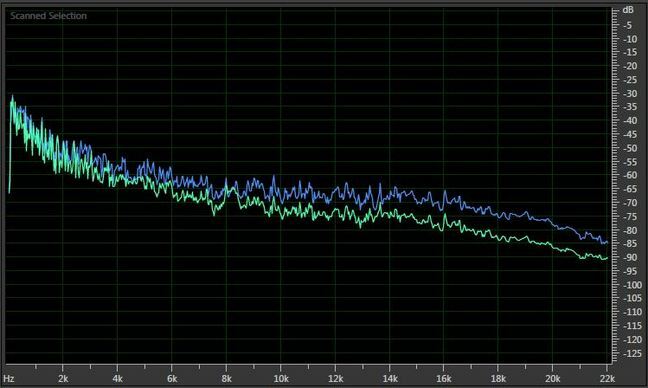 This confirms the use of a converter with very advanced digital filters that best meet the current "audiophile" approach. In Figures 9 and 10 we see finally the same frequency response of the previous figures, but here the horizontal scale is linear instead of logarithmic, so as to better highlight what happens at very high frequencies. My first analysis ends here. I hope you found it interesting.